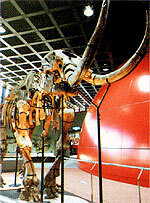 The Museum of Nature and Human Activities, Hyogo (HITOHAKU, an abbreviation in Japanese) was opened on October 10th, 1992. Since then, this museum has been aimed to help citizens of Hyogo prefecture, as well as those from other regions, appreciate the beauty and dignity of nature around us. Here visitors can enjoy unique exhibits and educational programs about nature and human life. Staff of The Museum consists of two groups, of which one accommodates researchers and office workers belonging to the Board of Education, Hyogo Prefectural Government. The other group encompasses faculty members (i.e., professors and instructors) belonging to The Section of Nature and Environment, Institute of Natural and Environmental Sciences, University of Hyogo (UH), which is also housed in The Museum building. While engaging themselves to researches of their own themes and education of students in The Graduate School of Human Science and Environment (UH), they are also involved in various activities of The Museum as its joint-appointment staff in close cooperation with the above-mentioned full-time staff of The Museum. The museum supports interdisciplinary researches on various aspects of nature and human-inhabited environment. The museum houses extensive collections of geological and biological specimens, as well as photographs, prints, and recordings. Our herbarium (HYO) is listed in Index Herbariorum. *Half price for disabled persons and persons aged 70 or older. *Free for up to one carer of each disabled person. From 10:00 am to 5:00 pm, admission until 4:30 pm. Every Monday (or Tuesday if a National Holiday or its substitute falls on Monday [see below for exceptions]). From December 28th to January 2nd (Winter Hollidays), and from January 9th to February 10th(period for maintenance and renovation of exhibitions). * From the JR Osaka Station to the Sanda Station by JR Takarazuka Line (line bound for Shin-Sanda, Sasayama-guchi, or Fukutiyama Station), and from the Sanda Station to the Flower Town Station (line bound for Woody Town Chuo Station) by the Kobe Dentetsu Line. Five minutes walk from this station. 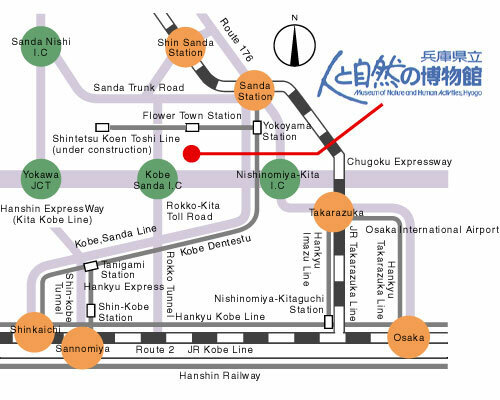 * From Subway Sannomiya Station to the Tanigami Station by the Hokushin Kyuko Line. From the Tanigami Station to the Yokoyama Station (line bound for Sanda Station), and from the Yokoyama Station to the Flower Town Station (line bound for Woody Town Chuo Station) by the Kobe Dentetsu Line. Five minutes walk from this station. 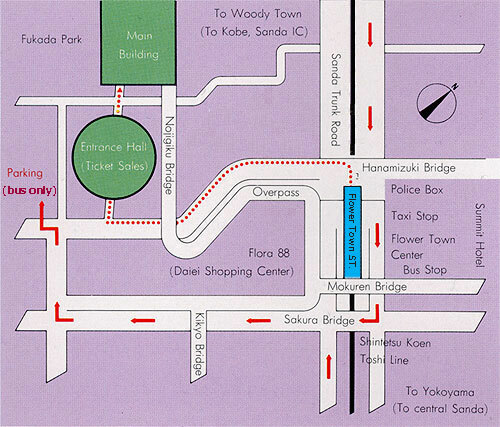 * Five minutes from the Kobe Sanda Interchange. * There is no parking at the museum. So, please use the public car parkings nearby located. * There is a priority parking site for handicapped people. Starting from the third floor and ending on the first floor, the ordinary exhibitions are arranged into five themes. There are ten terminal displays of information, where you can take a view of 3D map of Hyogo Prefecture, virtual museum, and videos introducing nature and environment of Hyogo. Also, you can access various pieces of information regarding biological, geological, and landscape diversities of Hyogo through the electronic picture book. Besides these, you can enjoy with quiz program. There are two terminal displays of museum information system on the third floor, where you can access gross view of exhibitions there. Also, you can challenge quizzes on relevant topics. Here you'll find a variety of specimens of plants, animals, rocks, minerals, and fossils. Visual materials for environmental education are also available. Visitors are invited to examine all of these items. Extending from coast of the Japan Sea to that of the Seto Inland Sea, Hyogo is composed of a number of unique natural environments. Large panels, videos, and the georama highlight the distinctive natural beauty of the Tajima, Tanba, Harima, Hanshin, and Awaji areas. Here we review the history of human beings and their environment. Since the discovery of well-preserved fossils of an early Cretaceous sauropod dinosaur from Tanba in August 2006, our museum saff have been engaging themselves to excavation of dinosaur and other Cretaceous vertebrate fossils from this and adjacent regions, as well as academic studies on the resultant materials. Exhibitions here introduce these activities to the present with many pieces of real fossils, replicas, photographs, etc. This floor has three groups of exhibitions, The Specimen Repository on Display (SRD), The World of Aquatic Organisms (WAO), and Fossil Studio (FS). SRD shows some examples of actual state of specimens for researches deposited in the stock rooms of this museum. WAO features organisms inhabiting aquatic habitats in Hyogo. FS demonstrates handling of fossils for cleaning, an important process in preparation for detailed observations on fossils for reconstruction, etc. The earth was born more than four billion years ago. Since then, this planet has been home to a succession of various organisms including plants and animals. Now it accommodates a huge biodiversity as the stage of harmonius ommunity of life. There are two groups of exhibitions on this floor. One, History of Life, introduces the process of evolution of life from an initial emergence over three billion years ago to the appearance of human beings, as traced with a succession of fossils. The other, Forest of Harmonius Community, exhibits the actual state of rain-forest on Borneo, where numerous organisms co-exist in good harmony. These exhibitions altogether demonstrate fascinating beauty of our planet of life. 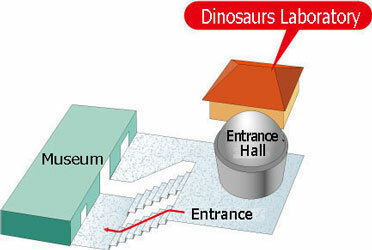 This facility, located beside the Entrance Hall close to the entrance/exit of the Main Exhibition Building, is aimed to show visitors an actual process of cleaning of Dinosaur fossils excavated at San-nan Cho, Tanba City. Here you can stand close to labo tables and watch works of preparation staff, who remove soils and non-fossil portions of rock from each piece of dinosaur fossil by skillfully handling elaborated and newly devised cleaning machines. Occasionally preparation staff may take a short rest, but you can still enjoy with exhibition panels etc., set in this facility. Opening hours: Open from 10:00 to 17:00 on Saturdays,Sundays and National Holidays. This journal is devoted to enhancement of discussion and dissemination of fundamental knowledge on science itself and human-science interactions. It was founded in 1992, and has been published annually since then. Each issue contains original research articles, reports, short notes, and/or reviews written in English or in Japanese. Another scientific periodical of ours, entitled "Nature and Human Activies", founded in 1996 as an entirely English series, was ceased after publication of No. 12 in 2007. English manuscripts formerly handled for this series have been considered for "Humans and Nature" since then.